Membership in the Pasadena Civil War Round Table insures that you will get regular updates on our activities as well as other Civil War related activities of interest. The small annual membership fee allows the Pasadena Civil War Round Table to meet various expenses related to our website and many other expenses related to bringing the best speakers we can to Pasadena. Join us and participate in this exciting opportunity to be a part of exploring the history of our nation. "We shall meet, but we shall miss him, and there will be one vacant chair . . .
. . . waiting for you at the Pasadena Civil War Round Table"
Note: The song, The Vacant Chair, was first a poem written by Henry Washburn to commemorate the death of Lt. John William Grout of the 15th Massachusetts Infantry, who was killed at the Battle of Ball's Bluff. 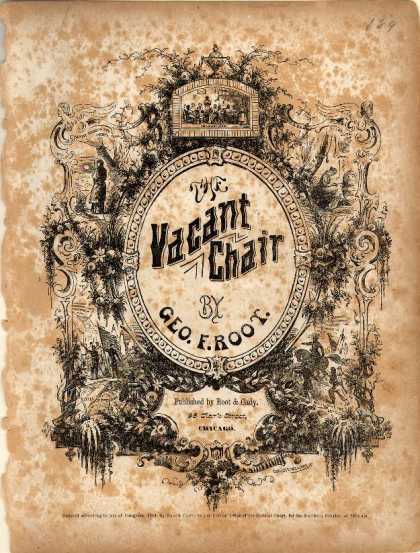 George F. Root put the poem to music and it became one of the most popular songs during the Civil War in both the North and the South. Meetings held at the Pasadena Central Library, CLICK HERE for upcoming presentations. To answer the call and join the ranks, send your annual enlistment bounty of $25 individual or $30 couple (one newsletter to same address). The Pasadena Civil War Round Table is an exempt organization as described in Section 501(c)(3) of the Internal Revenue Code. Your contribution, minus $8.00 for the cost of the monthly newsletter, is tax-deductible as a charitable donation on your annual tax return.